Alice + Freda Forever is a true-crime story set in 1892 Memphis, Tennessee. The teenage murderer provided a shocking sensation at the dawn of yellow journalism. 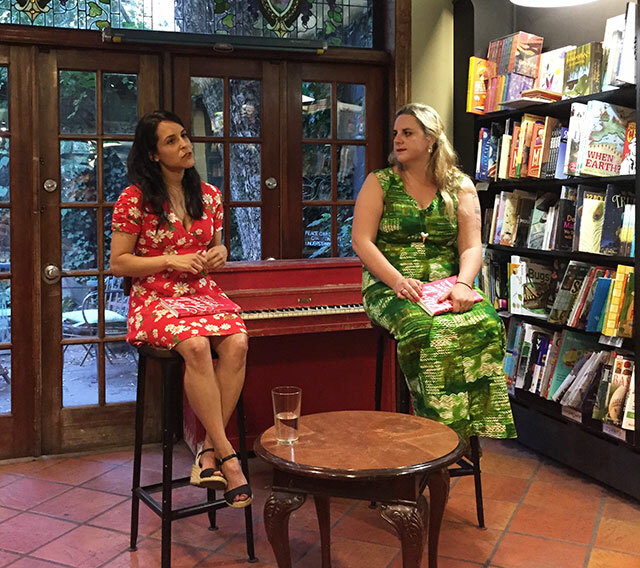 Alexis Coe discussed her book with Margaret Eby at Community Bookstore, sponsored by Vol. 1 Brooklyn. Coe explains she first discovered the story of Alice and Freda in graduate school. She spent four years researching the crime and trial struggling to find an outlet for the story. She was a professional researcher by day, and at night, used her access to read through old newspapers. When she went to write the story, it only took about year. When writing about real people, Coe says, it feels as though they have a longstanding intimate relationship with the writer. It becomes easier to see multiple sides of the subjects after that time including the good and the bad. She says that the resulting legal trial was unjust for everyone involved. “There are no heroes in this story,” she says. That lack is difficult for readers who want a hero. “In the 1890s, it was pretty clear the south was not going to rise again,” Coe said. Things had begun to fall apart. Plantations had fallen apart. The economy was falling apart. Newspapers had gone bankrupt. At the time in Memphis, a handful of white men who worked in the legal and political system were trying to keep things going, and that included owning and operating newspapers. The result was a lot of blame placed on the girls’ mothers. As historical figures, there were other sensationalist cases there were better known. But for Alice and Freda, following the Stonewall Riots, the LGBT community started looking for historical figures. As two women in a relationship that ended badly, they became minor icons. Coe says however that the girls’ were more unclear about their sexual preferences. Freda was engaged. It was not uncommon in the era for women to hold hands and even kiss. At the time, it would not have been difficult to see either woman as murders. Coe explains that several traits would have been considered sure signs of a problem: asymmetrical facial features, left handedness, and excitability. Alice played softball–for six months–which was also seen as damning, even though plenty of other members of the team went on to marry men and lead perfectly ordinary lives. One thing Coe would like to know is how Alice ultimately died. She was placed in an institution that was overcrowded. Coe found lots of information on Alice up until she ended up in the asylum, but after that the records are less clear. The two possibilities are suicide or consumption, a catch-all phrase that could mean almost anything. Coe is now headed to California to consult on a film script based on the book. Jennifer Kent is set to direct the adaptation. Though Coe is working with the production, she says she expects it will be different. The movie will probably focus on the romance. “I respect other people, other mediums,” Coe says of the process, accepting that changes are inevitable.